Rowan, handsomely dressed in a custom hemp suit (The Harrison Suit), and Caitlin, glowing in her customized wedding dress (Fiorella), gave me the great pleasure of being invited to their wedding. 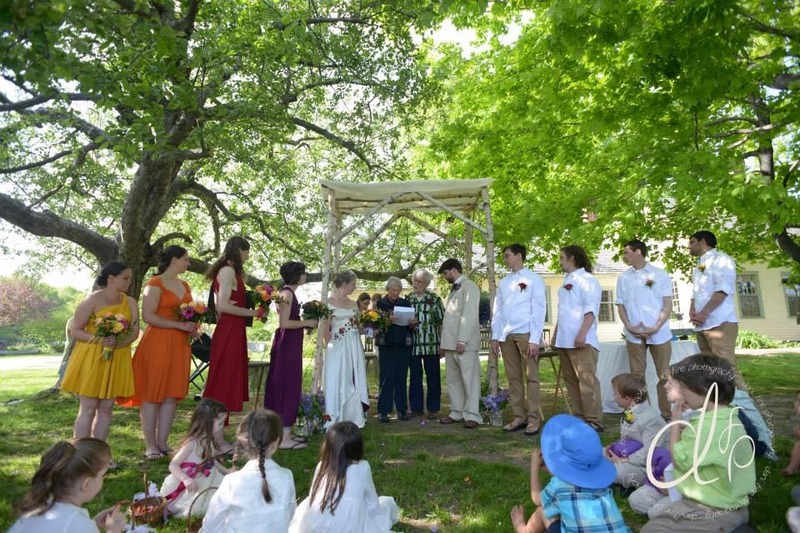 Rowan built the Chuppah, (the Jewish wedding canopy they stood under during their ceremony). We were all gathered around in a field surrounded by trees in bloom, and the smell of lilacs all around us. As the groom and best man came down the aisle, they walked to the tune of a live bagpiper. The flower girls followed to a symphony version of Guns and Roses’ Sweet Child of Mine. 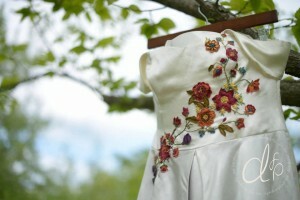 I embroidered and appliqued their dresses with flowers and ribbons to match Caitlin’s hemp wedding dress. The ring bearers and a little boy named Evan marched behind them with the traditional wine glass wrapped in cloth. Lynne, the very proud mother of the bride, followed. She wore a magenta jacket of bamboo jersey with a floral-printed blouse adorned with copper rose chain embroidery and a matching hand bag (for tissues, of course). As the bride came down the aisle with her father, the breeze blew, flirting with her gown and showing off the purple accents of her petal skirt. The ceremony was conducted by a close family friend who invited all those present, and the missed, to join and support Caitlin and Rowan in their new journey and commitment together. A beautiful poem was read by his grandparents that reminded all of us what marriage is truly about: the difficult times, the friendship, trust and work that comes with commitment. Their ceremony and vows were incredibly personal, sentimental and beautiful. 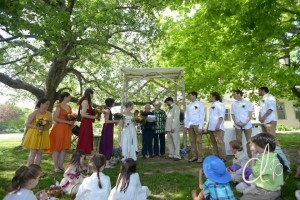 Rowan and Caitlin signed their marriage certificate with all of their family and friends as witness. Then the moment we were all waiting for… they came back into their Chuppah to embrace in a kiss. Rowan sealed their commitment with the traditional breaking of the wine glass. 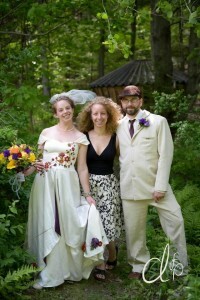 Rowan in his custom hemp suit and Caitlin in her custom hemp wedding gown under the Chuppah for their Jewish/Irish ceremony. Their ceremony and vows were incredibly personal, sentimental and beautiful. The ceremony was followed by delicious hor d’ oeuvres including scallops wrapped in leeks, and a personal favorite of mine, spanakopita. Lynne, the mother of the bride, introduced me to so many wonderful family and friends. This wedding was full of good people, good music, and heartfelt feelings for the bride and groom. I was delighted to sit with a witty couple from New York that have been together 26 years. They kept me laughing. We shared many stories while the bride and groom danced to Led Zeppelin’s All of My Love and their parents joined them on the dance floor. Thank you, Caitlin and Rowan, for inviting me to your beautiful wedding–and Congratulations! 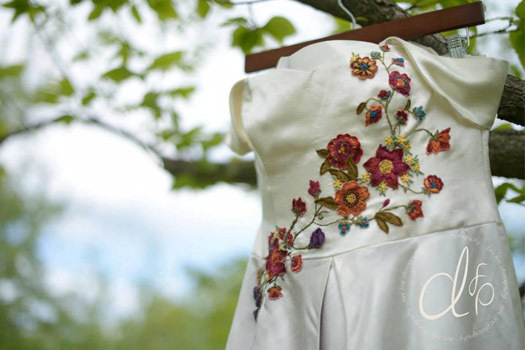 Adorned with hand-embroidered and beaded flowers, Caitlin was beautiful in her custom hemp and silk wedding gown. 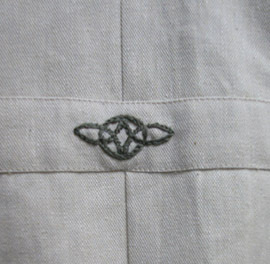 Hand-embroidered eternity knot, the Celtic symbol of love, was sewn onto the cuffs, back belt, and pockets of the groom’s suit. embroidered on the cuffs, the back belt, and front pockets . 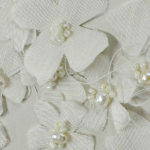 The veil, garter, and mother-of-the-bride’s outfit were also custom ordered, as well as the embroidery and embellishment on the flower girls’ dresses. 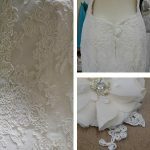 You just found the place for Truly Unique Wedding Attire Custom Made for You! Are you looking for a natural, alternative suit or wedding dress that captures your spirit? 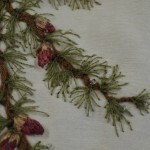 You’re going to feel right at home when you speak directly with eco-couture fashion designer Tara Lynn. 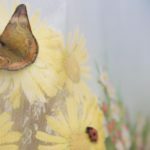 She will help you find or design an eco-friendly, unique wedding clothes. Call 802-467-9036 for a personalized experience.